An artist's rendering of what the remodeled property might look like. 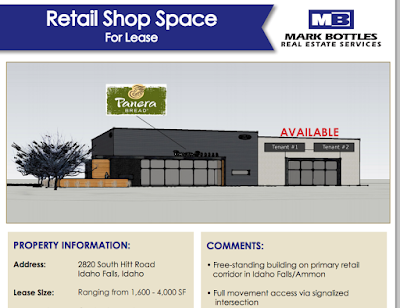 Panera Bread, a national chain of bakery-cafes, has filed paperwork with the city of Idaho Falls indicating it plans to open in part of the vacant CD World building on Hitt Road. The papers, filed with the Idaho Falls Building Department in late July, represent the first step in the process. The real estate broker, Mark Bottles Real Estate Services of Boise, is still looking for a tenant to lease space on the north end of the 8,970-square foot building, at 2820 S. 25 East. As of June 30, Panera Bread had 1,926 bakery-cafes in the United States and Canada, operating under the Panera Bread, Saint Louis Bread Co. and Paradise Bakery & Café names. Going by the company’s Web site, this will be the first Panera Bread between Fort Collins, Colo., and the Boise area. The company’s development strategy calls for franchisees to open a number of units, typically 15 bakery-cafes over a period of 6 years. They must have a proven track record as restaurant operators, net worth of $7.5 million and liquid assets of $3 million. In 2007, Panera Bread purchased a majority stake in Paradise Bakery & Café, a Phoenix-based company with more than 70 locations in 10 states, mainly in the west and southwest). The Company purchased the balance of Paradise in June 2009. Since then, it has reach a market capitalization of $4.5 billion. Panera Bread has been recognized as one of Business Week's "100 Hot Growth Companies" and the Wall Street Journal's Shareholder Scorecard in 2006 named it the top performer in the restaurant category for one-, five- and ten-year returns to shareholders. This awesome news made my day! I'm looking forward to Panera's arrival in I.F. It can't come soon enough.